Get into this summer with the inviting S-104-DCP Cascade Sofa and Coffee Table. Durable steel frames, UV Resistant Resin Rattan Weave and washable seat covers make this a solid practical choice while aluminum accents and sleek edges round this design out. Featured in a Charcoal Black Rope Weave accented with Sunset Yellow seat covers this two piece set is a great way to enjoy your outdoor space. Bring a taste of the exotic to your dicor with this gorgeous table. The Moroccan pattern cut-out provides visual interest while the gold leaf finish adds depth and character to each individual piece. Finished on all four sides, this piece can be used for a multitude of purposes. Great as a side table in the living room, and accent table in a hallway or a night table in the bedroom. Place multiple pieces together in front of a sofa for a unique, mobile coffee table. Contemporary luxury defines this beautiful coffee table. The rectangular tempered glass top is spacious and highly durable; it is anchored and supported by five chrome-finished, crisscrossed legs and black base with a mirrored finish. At nearly 4 in length and just over 2 wide, this coffee table offers plenty of space for all your entertaining and living needs. Its clean, sleek appeal will attract attention from every angle. Add serving space to your backyard with this generous table featuring an engineered faux wood top and variegated grey wicker base. This square patio coffee table is constructed using UV and weather resistant materials, making it easy to care for. Designed to be maintenance-free so you can focus more on enjoying the outdoors with your friends and family. Cascade Patio Sofa and Coffee Table Get into this summer with the inviting S-104-DCP Cascade Sofa and Coffee Table. Durable steel frames, UV Resistant Resin Rattan Weave and washable seat covers make this a solid practical choice while aluminum accents and sleek edges round this design out. 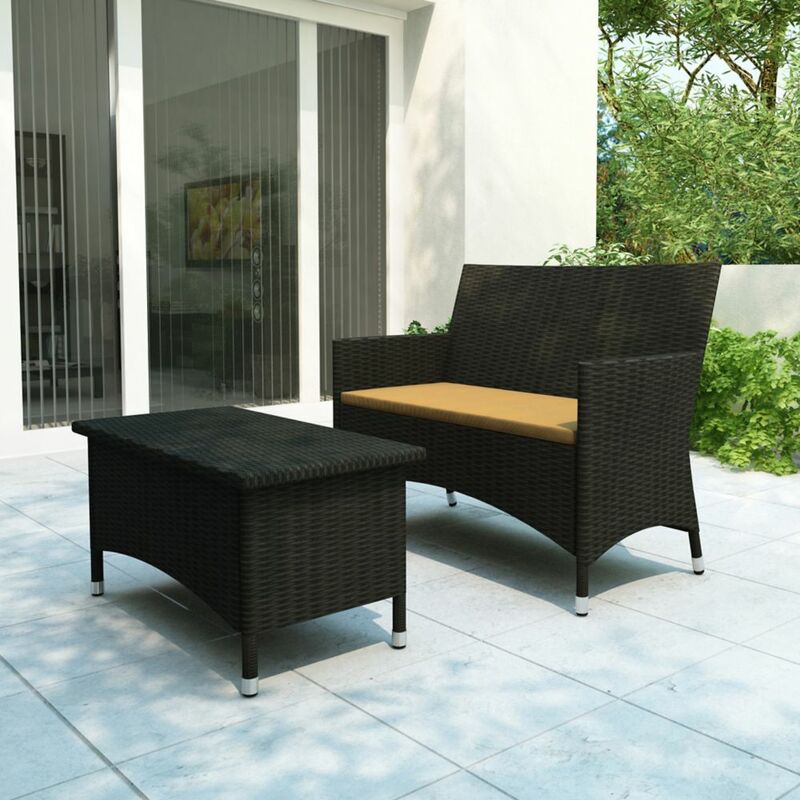 Featured in a Charcoal Black Rope Weave accented with Sunset Yellow seat covers this two piece set is a great way to enjoy your outdoor space.